Topics: Amtrac - Metal Technical Roofing, Seo By Artio, and Amtrac Roofing & Cladding. 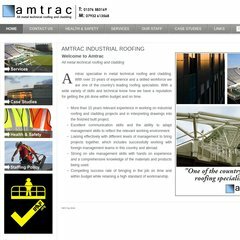 amtrac.biz Industrial Roofing in Buckinghamshire - Amtrac - metal technical .. The programming language environment is PHP/5.2.17. Its 2 nameservers are ns.123-reg.co.uk, and ns2.123-reg.co.uk. It is hosted by Heart Internet Network England, using Apache web server. PING www. (95.131.65.147) 56(84) bytes of data.